Some even say, “Eating tomato sandwiches in the summer is the reason I started tomato seeds inside last winter and why I’ve spent weeks nursing along my tomato plants in the garden.” In fact, there are several controversies that arise whenever aficionados discuss this favorite (see below). Place second slice of bread, mayonnaise side down, on top of tomato layer. Enjoy your sandwich. Wet sandwich dripping on the plate is traditional. Do nothing that will diminish the flavor of the tomato. Over-peppering, over-salting, or too much mayonnaise will stand in the way. Layer thinly-sliced cucumbers and lettuce leaves on top of tomatoes before placing second slice of bread on top to complete sandwich. Make a traditional BLT (bacon, lettuce, and tomato sandwich). Be sure to use real bacon, fried crisply, and placed on the bread while still sizzling. Obviously, you get to enjoy your sandwich sooner if you don’t peel the tomato. But some people insist that tomato slices without the peel taste better and smoother going down. Should you use ½” slices? Or slice tomatoes thinly and layer them over the bread? Thicker slices mean a juicier sandwich, but they must be cut and pieced together to cover the bread (unless you’ve grown some super jumbo beefsteak tomatoes that, when sliced, cover a piece of bread on their own). Thinly sliced tomatoes can easily be layered to cover the bread. The original sandwich, traditionalists say, is made with white bread. It is never toasted. Use whole wheat only if you must. Brand? True southerners swear by Blue Plate (slightly sweeter) or Duke’s Mayonnaise – with a nod to Blue Plate. Light or nonfat mayo? Out of the question. Spread? Don’t try to go thin. Have a tomato sandwich tip or preference? Do you have a special tip or preference you use when you make a tomato sandwich? 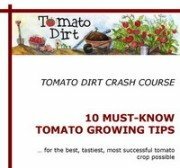 Share it with Tomato Dirt readers! Enter a title, such as "I recommend Wonder Bread for a tomato sandwich"
We use Hellmans mayo & real rye bread. Makes a great combo.